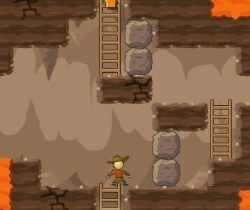 The object of the game is to navigate your way through 50 levels and try to escape the cave. 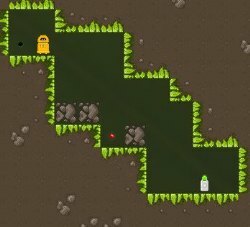 Along the way you will find complex puzzles, bomb your way through rocks and boulders, swing from ledges, and avoid pits of lava. Can you make it out alive? Use the arrow keys (or WASD) to move. Left and right are to run, up is to jump, and down to duck. Press space to throw your grappling hook and start swinging, then press space again to let go. Place dynamite by pressing down and space (press space while ducking). Make sure to get away in time! Click here to send Cave Escaper to your friends using your default email program.